Need a new boiler in South Shields? Get FREE no-obligation quotes now! 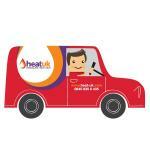 The Gas Trade Centre LTD t/a HEAT UK are Gas Safe registered heating engineers who supply and install gas boilers. For similar replacement boiler companies in this area please visit the South Shields boiler page. Family run boiler service, repair and installation company serving the North East of England for over 45 years. Which? 5 Star Trusted Trader. All makes and models serviced and repaired. Vaillant boilers installed with a 10 year guarantee.